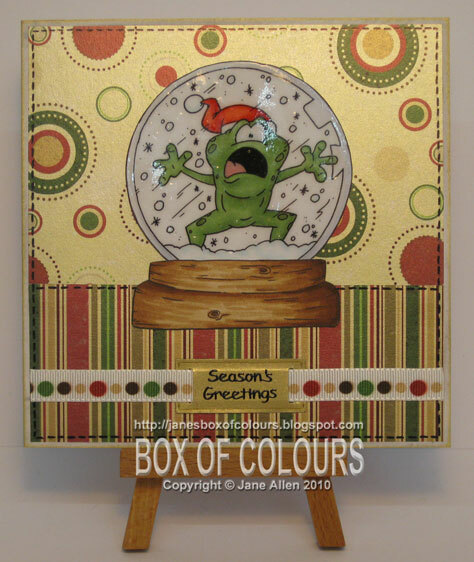 Image is from the amazing Dustin Pike & as usual coloured with Copics & glazed the globe with Inkssentials Glossy Accents. The scrumptious background papers are "Plum Pudding" from Crafts House, ribbon is American Crafts & the tag is Quickutz. Finally, faux stitching (black marker) and peel offs to finish - not quite a "speedy" card like yesterday, but guaranteed to make its recipient smile! Love, hugs & happy crafting! Oh the chill winds are beginning to blow here in England, my husband's gritting teams are going on their second call out of the season tonight, so wrap up warm & if you have to venture out tonight, take care as the roads will be icy! 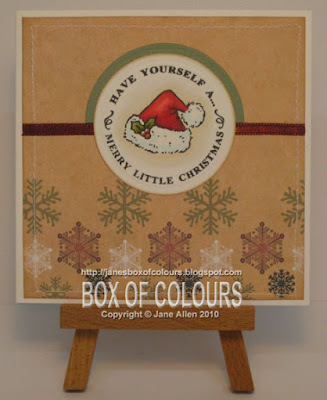 This is one of the simple designs I came up with using JustRite stamps - have you tried these? 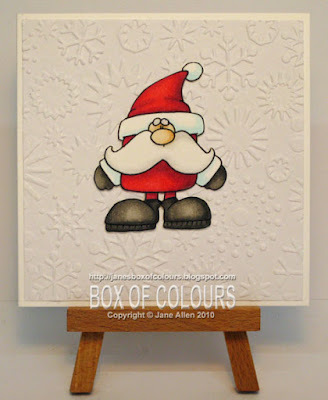 This image is from the 1 5/8 Merry Little Christmas set, one of the great thing about these stamps is that they are made specifically to fit your Nestabilities!!! Well, that's me done for now, off to get a cup of coffee - wrap up warm & get those crafty juices flowing!! 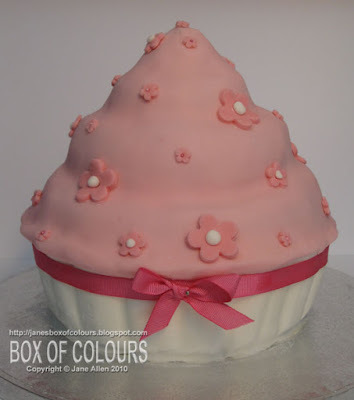 Well girls and boys I clocked up another year yesterday, but hey its a good excuse for something sweet and scrummy!! I don't know about you but I am all for tradition, and a birthday just wouldn't be complete without a cake - yesterday was no exception. Its not quite up to the standard of Duff Goldman at Charm City Cakes (love that show - totally hooked) but even though I say so myself, it tasted pretty good. OK, I confess, I didn't carve it by hand, I used a really cool cake pan from Lakeland﻿﻿﻿﻿﻿﻿ then covered it in fondant icing. What you can't see is that the base of the cake is chocolate marble cake whilst the top is made of strawberry cake. I was really nervous making it as it was the first time I'd used this pan - but with the addition of a little Cake Release my worries were unfounded & once cooked the cakes popped out of the pan without a hitch woo hoo! I had a really great day yesterday & am now the proud owner of an airbrush kit & compressor for my Copic Sketch - so watch this space for the results over the next few weeks............ once I stop playing with shrink plastic that is. I never tire of watching that stuff curl up and shrink, producing a minature version of a stamped image - its so cool!! Happy crafting folks and I'll be back with some of my latest projects very soon. Hope everyone planning a Bonfire Night celebration this weekend has a fun (and safe) time! 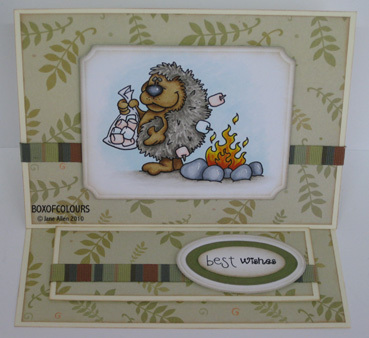 ..............and please make sure you've checked that one of these prickly little friends hasn't made a home in the bonfire before you light it!! Sadly I've not posted as much as I'd planned, unfortunately our son was feeling generous this week and shared his cold with the rest of the family! So the only paper product I've been playing with has been a box of tissues!! !